I was born in England, but came to San Francisco more than 30 years ago. I am a wife and a mother and do community outreach for three photographers. I love my family, traveling, photography, the outdoors, Japanese food and new experiences. 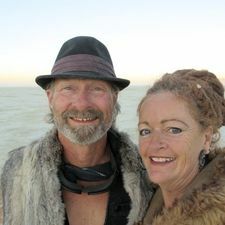 My husband Skate is a fabulously talented musician working as a K-8 music teacher, occasionally performing and also makes WaterContraptions https://www.watercontraptions.com Together we love to host both Airbnb guests https://www.airbnb.com/rooms/702819 and karaoke parties and enjoy watching people have a good time! You MUST have a karaoke party here! You and your friends will never forget it. The warmth, the hospitality, the location all create a magical rocking good time, whether you are a singer or musician - no matter! The two times my husband and I have attended, we had to pull ourselves away...."one more song!" Skate and Jeannie are the best hosts you could hope to ever have, not to mention talented in the musical and technical department - everything just flows. There are thousands of songs to choose from. When you want a break from all the singing, just step outside and take in the twinkling city view, and walk into the stunning garden perched on the side of Bernal Hill with hidden benches tucked away, and even a treefort. If you want to throw a completely unique and totally fun San Francisco party - do this!! I have to say, this was one of the most delightful evenings I've had in a long time. I never really understood how cathartic it can be to sing 'Wuthering Heights' by Kate Bush on a beautiful evening with friends... Great vibe and energy...absolutely loved it! WOW!! If you were sitting around, staring at the walls, nothing to eat or drink, no conversation...no nothing.....BUT, you were at Jeannie and Skate's Amazing House Of Amazingness.....You would be having the time of your freaking LIVES with these two divine beings!.....Guaranteed!.....So, top that off with a Karaoke Night?....Foggedaboudit!! My most memorable times in San Francisco were definitely shared with Jeannie and Skate....I cannot possibly say enough positive things about these insanely beautiful people!....There just aren't enough adjectives. Their Home is as inviting as they are....As colorful as they are....As comforting as they are....Warm energy abounds in that house, with those people....The smell of awesome food is always present, as well as thoughtfully concocted cocktails! Jeannie and Skate are the type of people that, if they were to show up at my house, totally unannounced, totally unexpected, at 4 in the morning....I could not possibly be more stoked! Hearing Skate sing and play guitar will leave you wondering how he isn't a household name...He is an incredible talent, as well as an angelic person....This will take you about two seconds to figure out for yourself. Jeannie is truly a goddess!...She defines "Hostess With The Mostest". She is never without a smile, or topic for inspiring conversation.....Jeannie is the warm Sun on a cold, foggy San Francisco day. If you are considering spending even a SECOND with Jeannie and Skate....You can count on a PRICELESS experience! Aloha Nui, Jeannie and Skate!